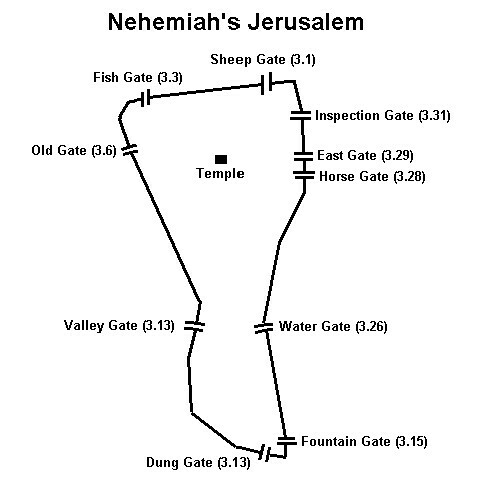 The 10 Gates of Nehemiah’s Jerusalem. The layout and positioning of these gates can be seen in the pictures above. Sheep Gate Neh 3:1 – Salvation and a place to enter in. Offering yourself as a living sacrifice and remembering that as the lambs were brought through this gate for sacrifice so too it was possible that this was the gate Jesus entered on Palm Sunday. We are called to make a commitment to Christ with our whole lives. John 10 :9 I am the GATE. Fish gate – Neh 3:3 Fisherman from Galilee would bring their fish into the city through this gate to be sold at the markets. It is a symbol for me of evangelism and the importance of bringing folk into the love and acceptance of Jesus Christ. It is Jesus call on our lives to go and make disciples. I will make you fishers of people. Old gate Neh 3:6 – Following from the Fish gate was the Old gate. Nehemiah is the only book in the Bible where it is called the Old gate and it may have been one of the original gates made. Too many Christian’s today want something new. The latest teaching, the latest experience… Or they try to change truth to make it acceptable with what the world thinks is right ‘today’ (which may not be the same as what it thinks ‘tomorrow’.) But the Ancient of Days calls us back to His long established ways that do not change and remain the same yesterday, today and forever. My friend Leonard Sweet who is my mentor and one of the 25 most influential theologians in the world right now, says you need to have a rear-view mirror in order to drive a car forward. Valley Gate Neh 3:13. The valley opens out at this gate which apparently opened out to the valley of Hinnom.You may notice that there is a long distance before you come to the next gate, which is the valley gate. For a new Christian the Lord allows a ‘honeymoon’ type period where He teaches you and His presence is strong in your life. This can go on for some time as indicated by the positioning of the old and valley gates. But sooner or later the valley gate must come. The valley gate speaks to us of humbling and trials – valley type experiences used by the Lord for our personal growth. Never easy but the Christian needs to remember that in the natural nothing really grows on the mountain tops, but it certainly does down in the valleys. So it is in the spiritual. Never a nice experience but it always produces fruit. Psalm 23 speaks about the shepherd’s rod and staff comforting me. We need to stay close enough to the tapping of the rod so that we can hear which way to go in the valley and if we do fall into a ditch, that his staff can pull us out. Dung (Refuse) Gate Neh 3:14 All of Jerusalem’s refuse and rubbish was taken out through the dung gate, down to the valley of Hinnom, where it would be burned. Clearing away the rubbish in our lives is never easy but the benefits of this experience can be seen in the next gate.So often we carry too much stuff around which is not useful. Illus of the 600+lb woman and constipation which is never pretty. Get rid of the stuff that keeps you away from being effective for the Lord. Water Gate Neh 3:26The Water Gate led down to the Gihon Spring which was located adjacent to the Kidron Valley. The tunnel of Hezekiah. The need for the body to have water. If you cut this supply you are dead and a whole city could be destroyed. We need spiritual water so that we will not thirst again John 4. 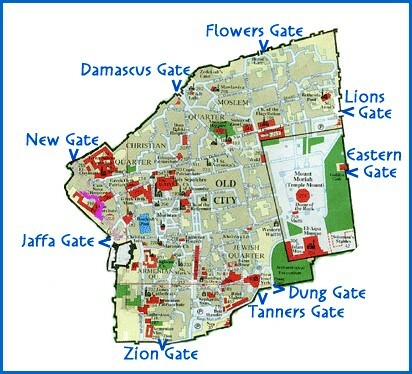 9.East Gate Neh 3:29The East gate is located on the opposite side of the Mount of Olives. Personal aspect: Ezekiel 44:1-3 ‘… the gate that looked toward the east, and it was shut. The Lord said to me, ‘This gate shall be shut; it shall not be opened, and no one shall enter by it, for the Lord God of Israel has entered by it.’ The east gate opens and looks toward the Mount of Olives. (Zech 14:4).The east gate then speaks of the return of Jesus Christ. For our Christian life it shows us of our need to live with this hope and to long for His return. A specific crown is even given to those who do this (2 Tim 4:8). Only Jesus really can open this gate but He does stand and knocks on the door of the world which has shut Him out in many cases. 10.Inspection Gate Neh 3:31 Also known as the Miphkad gate. The word in Hebrew has a military connection and according to tradition it was at this gate that David would meet his troops to inspect them. Personal aspect: The final gate is the inspection gate. This gate speaks to us of the examination of our lives by the Lord. Search me O Lord and know my heart today…This occurs in this life as indicated by Paul in 1 Cor 4:4: ‘For I am conscious of nothing against myself, yet I am not by this acquitted; but the one who examines me is the Lord.’ In our Christian experience we should be living with this in mind. We are called to live our lives with eternity in view, caring more for the things of eternity than the temporal that we see around us. Spend some time with each other reflecting on the gates. When are we access points? Give some examples in your life. How can we be a “gate” access point for others?